In the spring of 1988, a woman living on a reservation in North Dakota is attacked. Geraldine Coutts is traumatized and reluctant to relive or reveal what happened, either to the police or to her husband, Bazil, and thirteen-year-old son, Joe. While his father, who is a tribal judge, endeavors to wrest justice from a situation that defies his efforts, Joe sets out to get some answers of his own. The quest takes him first to the Round House, a sacred space and place of worship for the Ojibwe. And this is only the beginning. 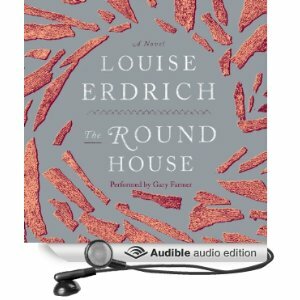 Louise Erdrich’s novel embraces tragedy, the comic, a spirit world very much present in the lives of her all-too human characters, and a tale of injustice that is, unfortunately, an authentic reflection of what happens in our own world today. This story highlights how a terrible attack on someone not only highly effects that person, but also their family and friends. This is such a sad story, but one that also has some humor thrown in, and is very thought provoking. The idea of your mom having such a horrible thing happen to her, and then she locks herself in her room, and you may never see the person who did this punished for it…what a heavy weight on Joe’s shoulders. He felt a mix of emotions, loss as his mother shut herself away from him, anger that his father, who was a judge on the reservation, couldn’t seem to bring the guilty to justice. And so, he wanted to get revenge himself. I loved the relationships between Joe, Cappy, Angus and Jake. I’m glad he had someone to help him through this tough time. The author did such a great job with the story line and characters that I had to keep reminding myself that this was a work of fiction. What happens in this book can and does happen, and you get a glimpse of Native American traditions and laws which added to the non fiction feel. Excellent book, although the ending wasn’t what I wanted. I listened to this on my iPod and thought the narrator did a great job. This one is on my wish list, but I hadn’t considered audio. Thanks for the review! I’ve had this for quite a while and know I need to read it. It sounds great but disturbing. This quite a tough one to get through but I agree, it is excellent! This one sounds good but emotionally heavy. Glad the narration was good. That makes all the difference in an audio book.